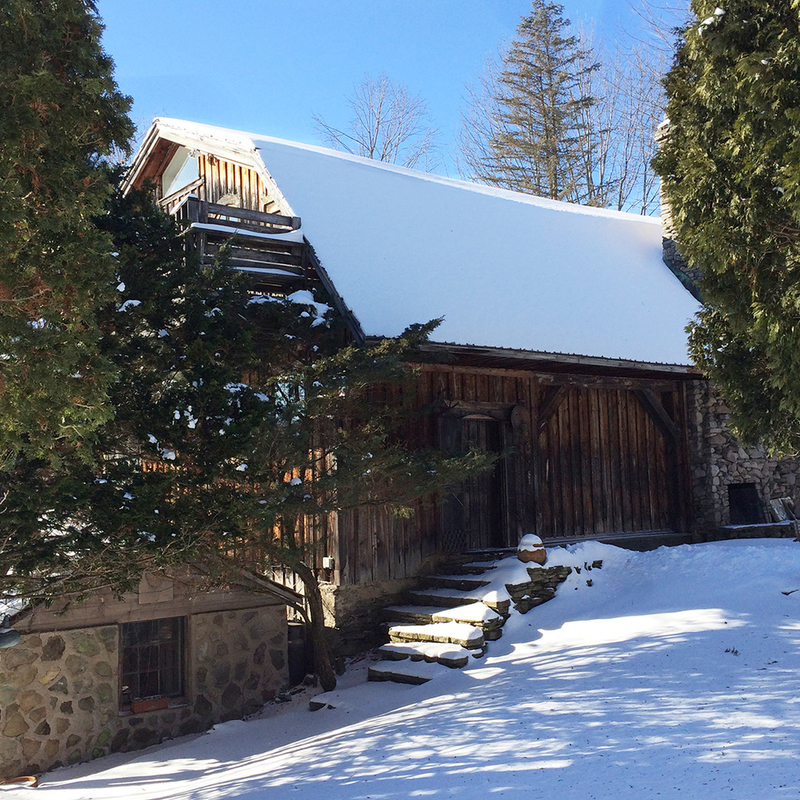 William Brown Road (Sold): Former Dairy Barn on 15 acres w/ Guest Cabin and Pond. 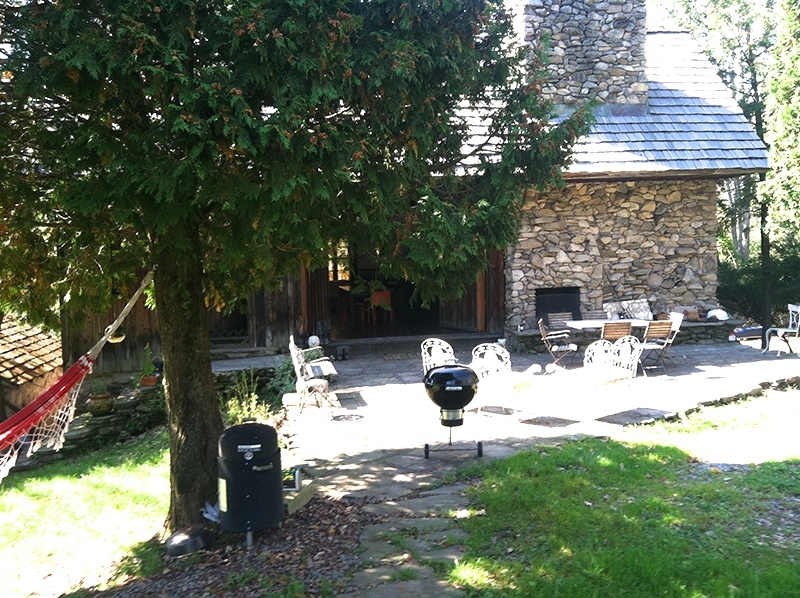 $350,000 — Country House Realty: Fine Catskills and Upstate New York real estate, including Sullivan Co. and Ulster Co.
• Listing Price: $350,000 (This is a short sale price) SOLD. 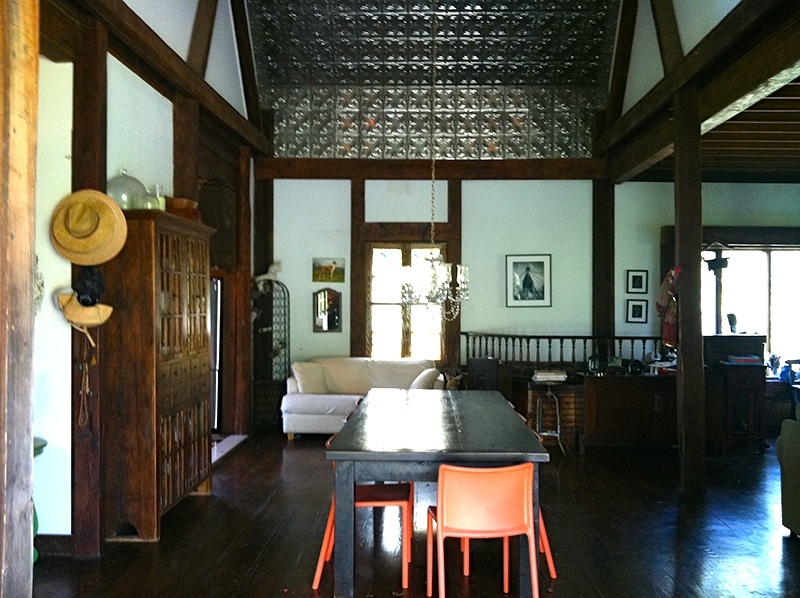 Nestled at the base of a secluded 15-acre parcel in the Upper Delaware River Basin, William Brown Road is a rare barn renovation by an artist who had the luxury of time and the luck of a terrific imagination. Over a decade starting in the late 70s, he gutted the three-story, 1902 dairy barn, and brought in local craftspersons to help shape his homestead vision. 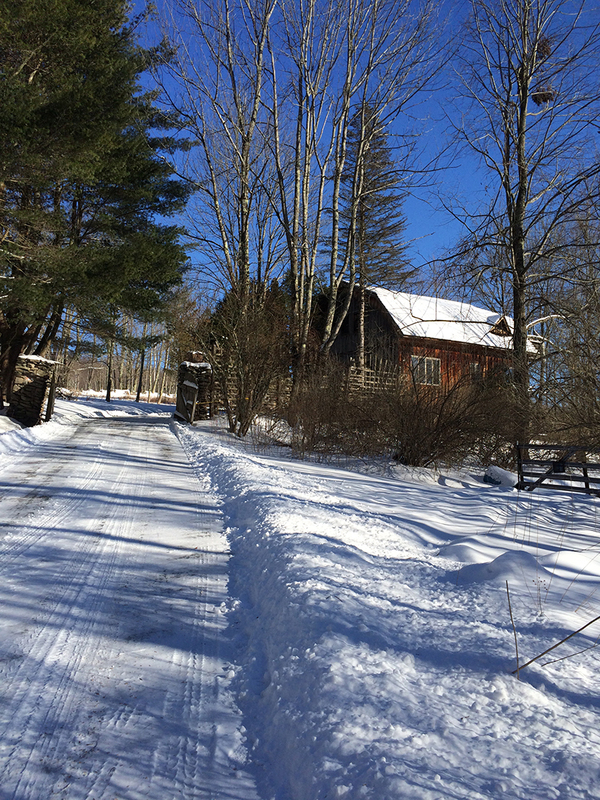 Enter the property down a curvy drive, which winds over a creek, past a tall and sturdy treehouse, and up through vintage stone and wood gates. Park at the garage level, or drive up to the 300 square foot bluestone patio, and enter through the main doors. There at the front of the house, a wooden front door with a weathered brass knocker is just to the left of two massive barn doors. The doors are one of the barn's many unique features - they unlatch from inside and pull open to create a 9 x 15 passage from the main floor directly to the great outdoors. 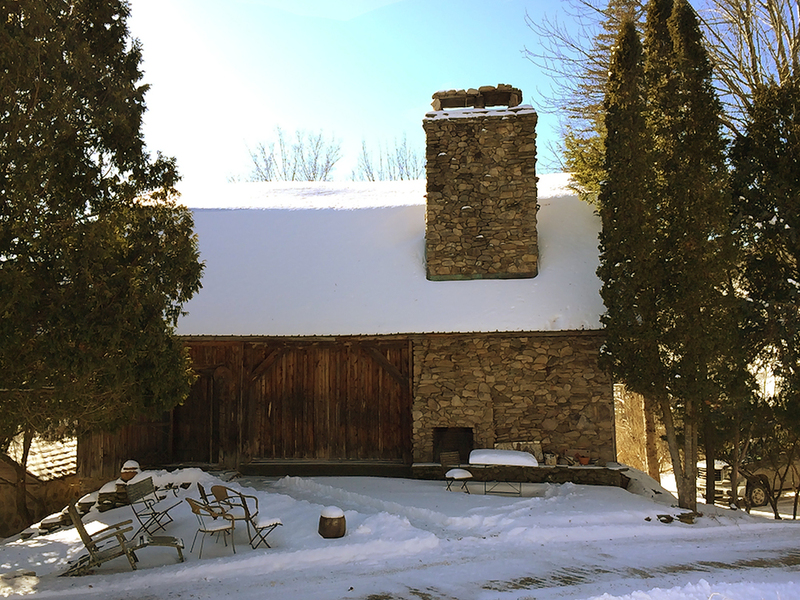 To the right of the barn doors is a impressive 30-foot stone chimney - meticulously installed in the 60s by a Frenchman and his two sons. Inside the front door, there's a small entry featuring a marble countertop with ample cabinet space above and below. 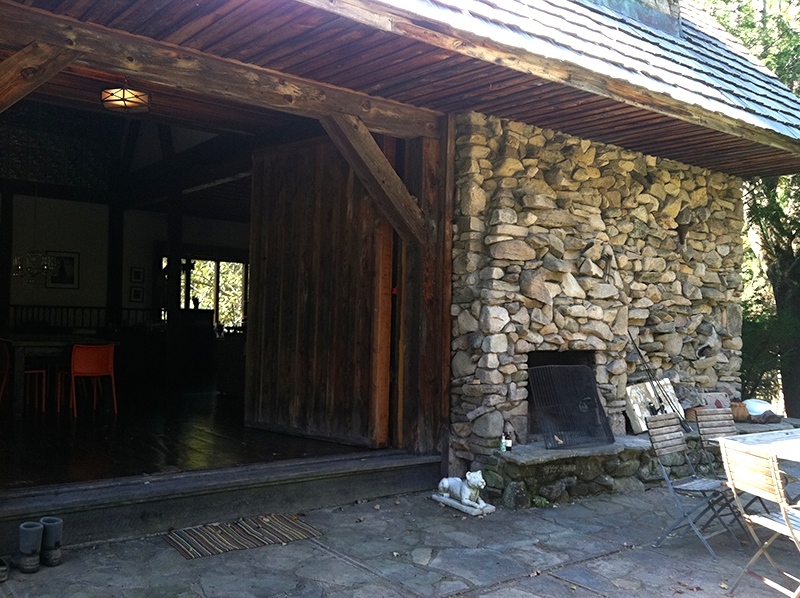 To the left of the entry is a winding, wood staircase with a coat closet underneath. Walk straight ahead into a large and bright, fully equipped kitchen, featuring stained-glass pocket doors, brick and wood counters, and a colorful, hand-tiled marble floor. The kitchen is open on one side to the rest of the main floor, which is essentially an open floor plan but there are natural dining / living areas. The living area's giant fireplace features custom stonework that includes heat vents to help distribute the warm air, a stone and marble bench, and a storage area for dry wood. (Sadly, the marble bench has broken bits.) Large picture windows flank two corners of the living area, and there are stained and etched glass windows on every floor. The 20-ft cathedral ceilings, vintage lighting, and open rough-hewn beams make the barn feel expansive and intimate at the same time. Except for the kitchen and downstairs bath, both of which have marble floors, the the floors throughout are wide-plank Pennsylvania pine. Upstairs are two equally attractive bedrooms and a large catwalk / loft. 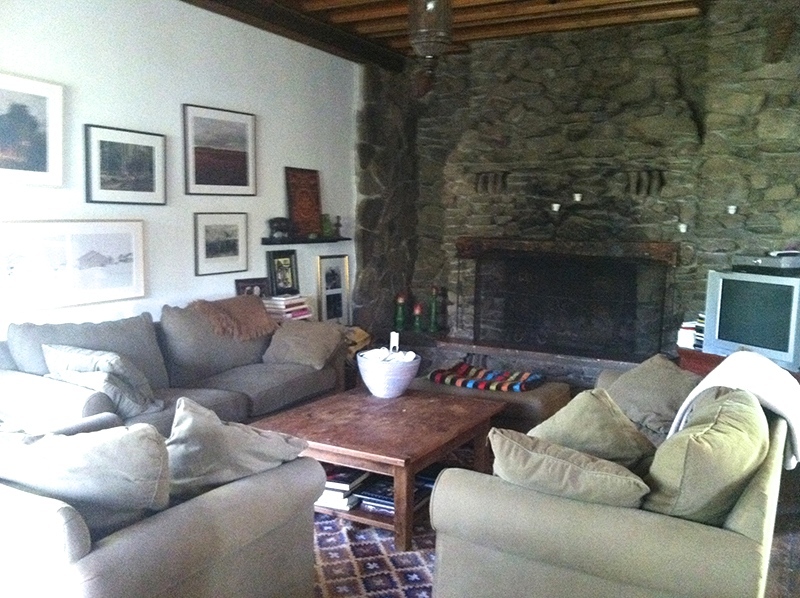 The loft area between the 2 bedrooms was previously used as a guest bedroom. The master bedroom has an en suite bathroom with clawfoot tub, plus a large deck with a refreshing rainshower and expansive view. 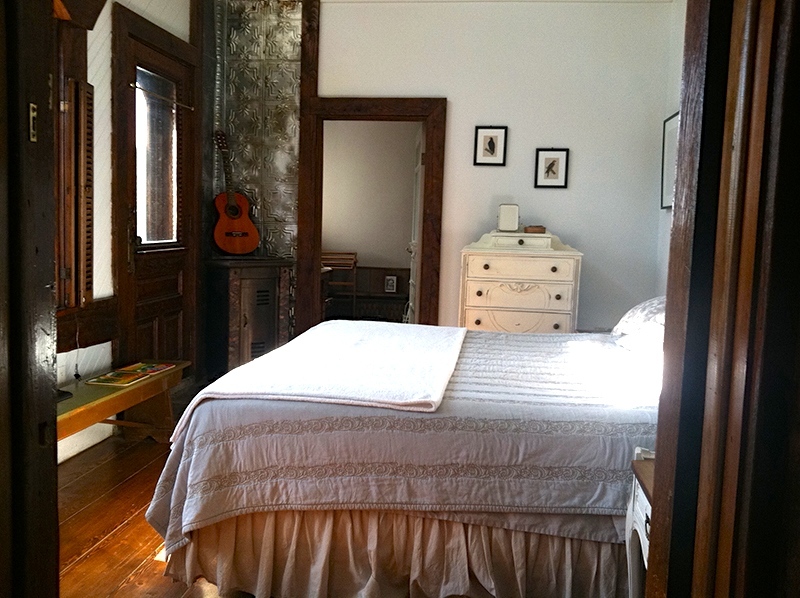 The second bedroom is twice the size of the "master" - room enough for two full or queen size beds - and features a working fireplace, and a wall of vintage-shuttered windows. 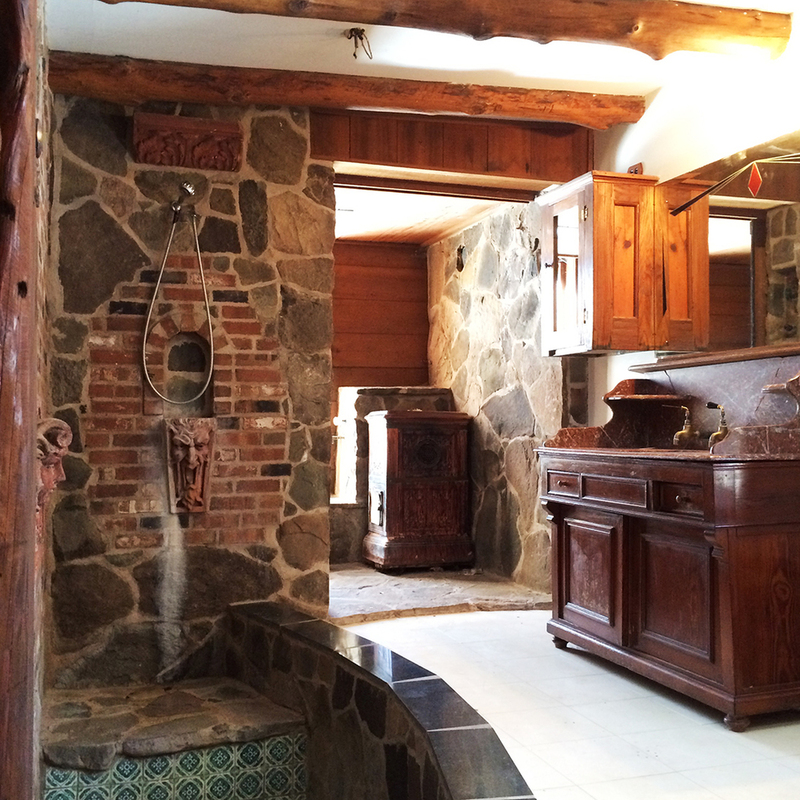 Down a set of marble stairs from the living area on the main floor is a Roman-style bathroom, with an enormous, hand-tiled tub and shower, and a cedar sauna. The remaining unfinished area in the basement is accessible for small vehicles, and stores the oil tank, mechanicals room (new boiler in 2008; on demand hot water 2009), and it also has a separate root cellar. 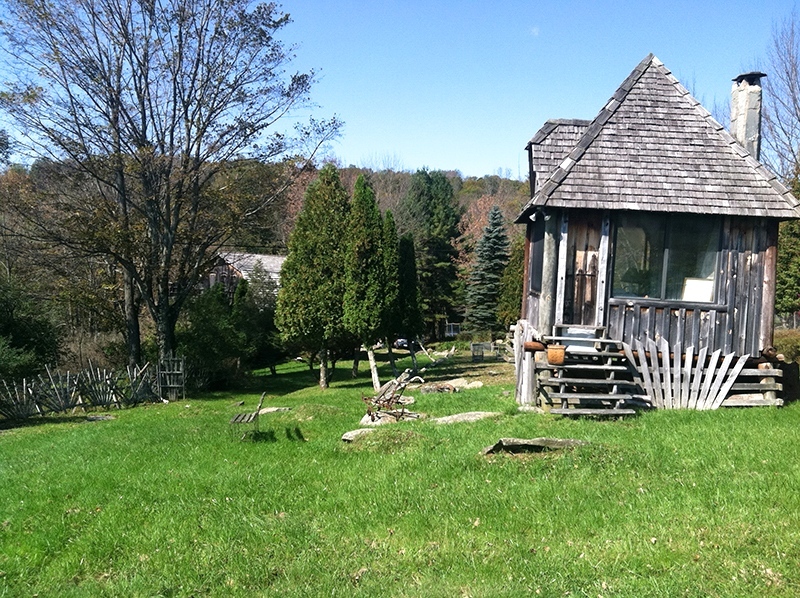 There are two out buildings on the property - a 2-person wood, guest cottage with a working fireplace and killer views. 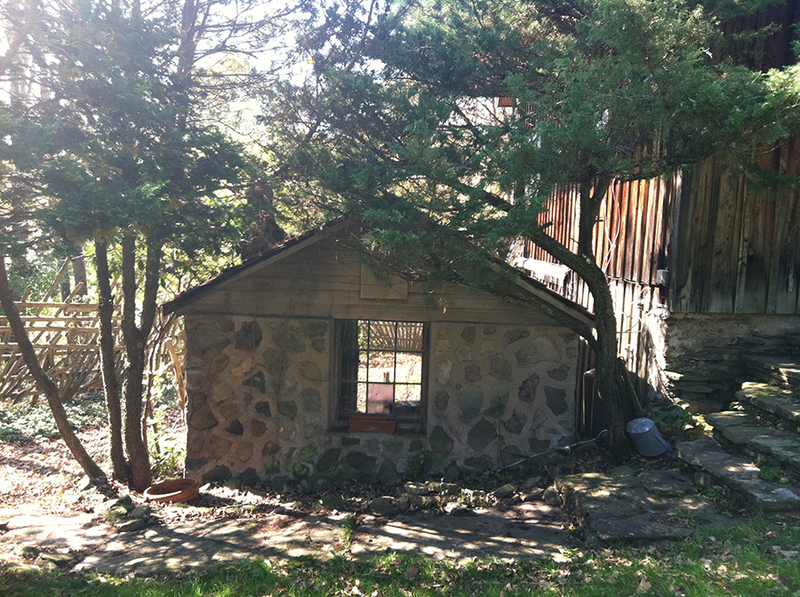 There's also a stone milk shed that could be renovated as an additional guest room. 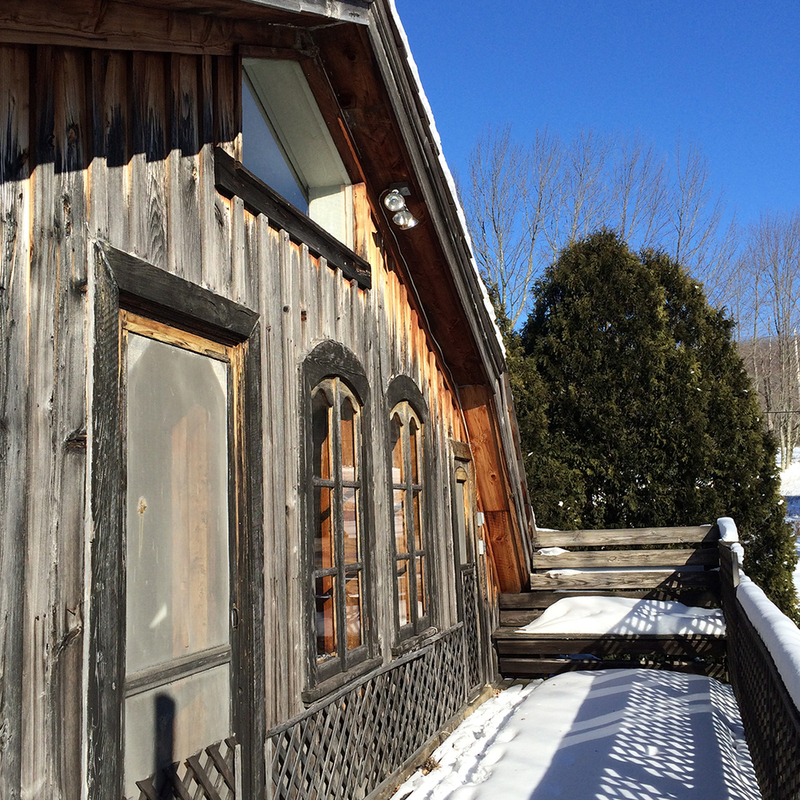 A new cedar roof was installed in 2009. 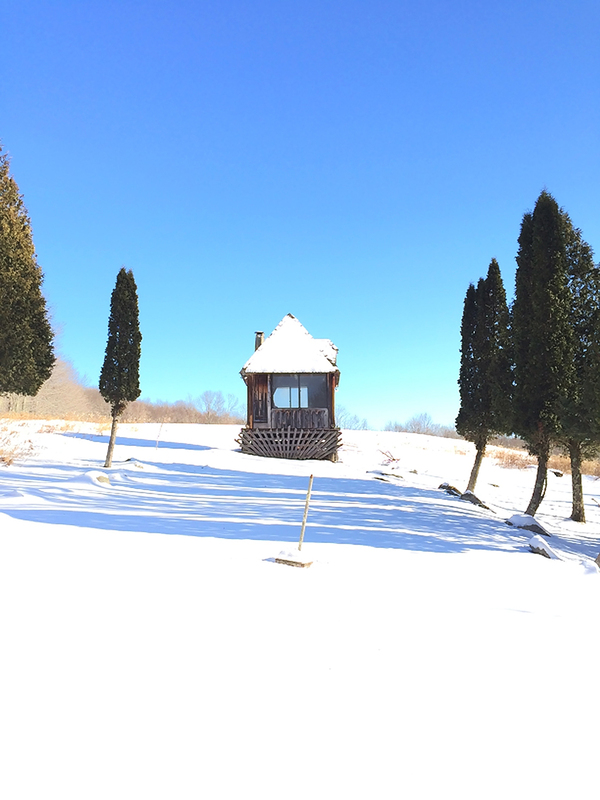 At the top of the property, before the 2 cleared pastures gently slope downhill to the woods, there is a quarter-acre swimming pond with views toward the Delaware and into Pennsylvania.